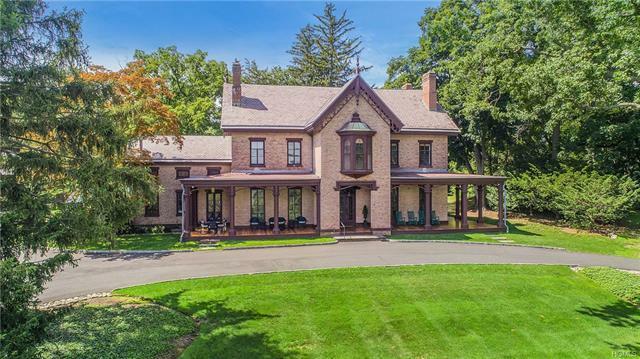 The Ross-Hand Mansion is one of the most admired homes in the Hudson Valley. This Gothic Revival mansion was built for famed architect Azariah Ross, designer of the stone bridges throughout Central Park. Much of the detailed woodwork in the home was added by William H. Hand, known for his intricate woodwork in the mansions in Newport, RI. Thoughtful updates combine beautifully with the grand rooms and elegant details making for comfortable, modern living. Stunning new master bedroom suite with fireplace, multiple closets and magnificent riverview bath. New, en suite bath in fourth bedroom. Private au pair suite. Smart home technology allows you to control security, lights and systems with one click. Other highlights include walk-up third floor, fully outfitted gym, seven fireplaces and wrap-around veranda. Situated on 4.0 private, manicured acres with commanding views of the Hudson River and the Village below. Don’t miss your once in a lifetime opportunity to own this iconic residence.